I recently returned from a European trip and had the opportunity to snap the attached picture from a waste disposal truck in the U.K. I was struck by the overt nature of the messaging involved. 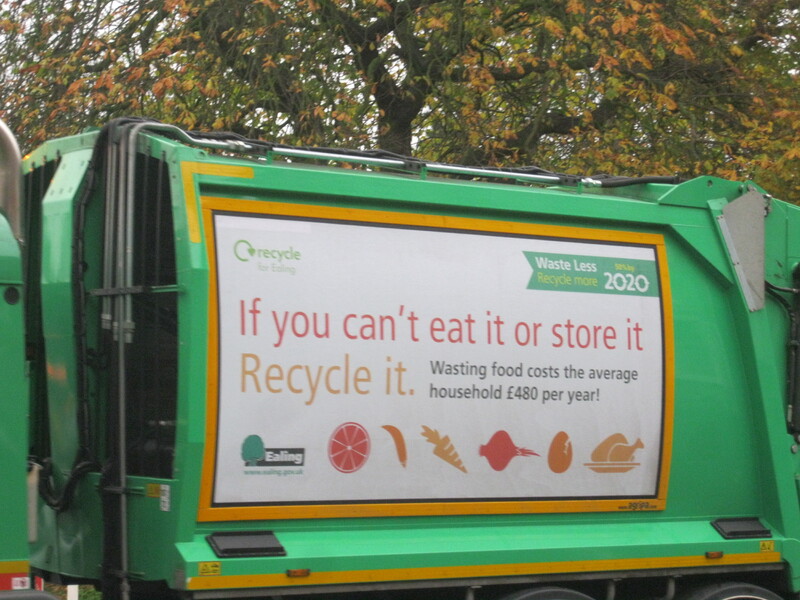 U.K. citizens are being educated on the annual dollar cost of food waste for an average family (480 British pounds, or about $800 US annually), and at the same time are being encouraged to recycle their excess food if unable to consume or store it. This is the type of impactful messaging that we need in the U.S. to make reducing food waste a mainstream issue. This theme needs to be on the minds of all Americans so that behavior change occurs at the individual level, and in turn drives change from retailers. A perfect example involves odd-sized or slightly blemished produce. Annually, millions of tons of high quality produce never leave the farm for the supermarket due to the American consumer’s quest for “perfect” produce. Such waste is far too costly – both from a social and environmental perspective. While the environmental benefit from recycling excess food is clear, we have tremendous opportunities to reduce food waste by redirecting excess food resources to assist the nearly 50 million food insecure individuals in this country. What’s more, we can redirect fruits, vegetables, and proteins — high quality calories that are desperately needed to stem surging rates of obesity — to the food insecure. The message of “reduce and recycle” is very worthwhile, but an even better message is “reduce, redirect, and recycle.” Europe is ahead of the U.S. in terms of awareness of the need to reduce food waste, as indicated by the EU’s goal of cutting food waste in half by 2020 (which is supported by the messaging campaign noted here). The U.S. needs similar aggressive sustainability-focused goals, accompanied by messaging campaigns to raise awareness and change behavior. In moving down that path, let’s put the priority on coming up with creative ways to route excess food resources to people in need first — and animals second — before the very worthy goal of composting. Reduce, Redirect, Recycle.